The brig Sally, Captain Mitchell commanding, arrived at the port of Philadelphia on August 12, 1796, after an uneventful voyage of sixty days from Le Havre. Among its passengers was a Swiss named Jean Jacques Dufour (John James in his American years), no longer in his first youth-he was then thirty-three years old-and remarkable at first glance only for having a left arm that ended at the elbow, probably a congenital defect. Whether he had any English before he left home is uncertain, but no doubt he had learned some on the voyage to add to his native French. Among the stream of emigrants seeking their fortunes in postrevolutionary America, Dufour had nothing to distinguish him, except for the accident of his arm. But he came to the new republic possessed by a single purpose: to make wine for a wineless country. And the extraordinary fact is that he succeeded. That success was limited, it was of brief duration, and it was largely carried out by others. But without Dufour's determination and his willingness to take advantage of what the country offered, it would not have come about as it did. Dufour was the eldest son of a family of vinedressers, as the term was then, living in the commune of Chatelard, near Vevey, on the terraced northern slopes of the Lake of Geneva between Lausanne and Montreux. This region, called La Côte in Switzerland, is ancient wine-growing country, the largest single concentration of vines in the country and the source of some of Switzerland's most distinguished white wines. Vevey is also the home of the venerable Fête des Vignerons, a celebration whose recorded history goes back to 1651 but which is probably even older than that. Dufour would thus have grown up in an atmosphere saturated in wine. But why, one wonders, should he have left a secure and established wine region for the infant United States, where wine growing was effectively unknown? That very fact seems to have been a part of Dufour's reason for making the venture: it had not been done, and he was romantic enough to think that he might be the one to do it (more prosaically, the family historian, Perret Dufour, says simply that the elder Dufour determined that his children should go to America for the sake of opportunity). John James Dufour himself said that he had been fascinated by the idea of making wine in America from the time he was fourteen years old and read in the papers some reports from French soldiers serving with the American armies in the Revolution complaining about the lack of wine "in the midst of the greatest abundance of everything else." There were all-too-good reasons for the absence of native wine in America, as explained in the introduction. Those reasons, however, remained essentially unknown in Europe, just as they were largely unrecognized still in America itself. When he consulted a map of the country to which he had determined someday to go, Dufour found that parts of America lay in the latitude of "the best wine countries in the world-like Spain, South of France, Italy, and Greece," and this seemed to him to be a promise of sure success. It is a fact that the northern limit of wine growing in Europe is roughly the fiftieth parallel, and that in America all of the contiguous states lie south of that. New York City and Rome are both on the forty-second parallel; Richmond, Virginia, and Athens are both on the thirty-eighth parallel. These coincidences seduced many an early entrepreneur into believing that wine might be grown as readily in New York or Richmond as in Latium or Attica. But the belief was a delusion; the differences in climate are so extreme as to make the argument from latitude utterly unreliable. Dufour, however, did not yet know that. When, at the end of his life, Dufour set down his account of his experience in the new world in his American Vine-Dresser's Guide (1826), he took an almost sacramental view of his purpose. By successfully producing wine, he wrote in his loose and difficult sentence style, he would "engage and enable the people of this vast continent to procure for themselves and their children, the blessing intended by the Almighty; that they should enjoy, and not by trade from foreign countries, but by the produce of their own labor, out of the very ground they tread, from a corner of each one's farm, wine thus obtained, first handed from the grand Giver of all good, pure, genuine, and unmixed by avarice, that it may have the effect on his heart and family intended by the Creator." Not only that, native wine would turn Americans away from their habitual use of ardent spirits-whiskey especially-and contribute to making the country temperate and sober. These arguments for the high social value of wine growing were heard from the very beginning of American settlement and form a kind of chorus behind almost every one of the countless attempts to establish it. Dufour was one of a long line in this matter too. Of course Dufour hoped to make money as well as to confer solid public benefits. He never did get rich, but something of his high expectations may still be heard in his language at the end of his life: "Millions," he wrote, "will accrue to the country at large" from the work he had done. And that, too, is one of the constant themes in the pioneer history of wine growing in this country: temperance, good cheer, and unbounded wealth are all mingled in the vision of America as a wine land. It is still an attractive vision. His preparation lasted much longer than one would expect. For twenty years or more, after he had formed his resolve to go to America, he was still in Vevey, where he had a wife and a son-hardly evidence of a restless spirit. About the wife nothing is known, except that she would never go to America; the son was an only child, named Daniel Vincent. Dufour was surrounded in Vevey by a large family: his father, also Jean Jacques, was still living, as were seven other children of the father's two marriages. What determined the moment at which John James Dufour finally set out for America can only be guessed, but the anxieties created by the French Revolution and by the Napoleonic Wars that followed are likely to have been among the main reasons. Following the outbreak of the French Revolution in 1789, there were severe political disturbances in Geneva felt all along the lake. When Dufour at last left Switzerland for America in 1796, Napoleon had not yet invaded the country, but he would do so two years later. Maimed as he was, it is not likely that Dufour would have been drafted as a soldier into the French armies, but the uncertainty of the times made the possibility of finding a new security in America attractive as it had never been before. Probably the idea of having the whole family emigrate to America had already been discussed, for Dufour was making inquiries about the possibility within a few months of his arrival in the United States. In any event, John James Dufour at last set out, alone, on his journey to America in March 1796, traveling by way of Paris to the port of Le Havre. While in Paris he bought fifty-nine silver and gold watches. These were to be used as a form of negotiable wealth after he arrived in America. When he needed to pay for something there, he could sell a watch. I suppose he feared that he would suffer considerable loss if he exchanged his Swiss money in America; the watches would have been less vulnerable to the vagaries of exchange rates. Once Dufour had landed in Philadelphia, he lost no time in scouting out the land. His disappointment was immediate and disturbing, for wherever he went he found only evidence of failure or of struggling and unprosperous survival in all attempts to grow wine grapes. At first, of course, he toured the settled East. We do not have a detailed record of his movements, but we know that he went to Baltimore, where he visited the small vineyard maintained by Charles Carroll of Carollton; he went up the Susquehanna River to Middletown, Pennsylvania, where a German had kept a then-decayed vineyard that had, allegedly, produced some wine. He saw some vines growing successfully in gardens in New York City and in Philadelphia, but these did not offer much encouragement to a commercial grower. Outside Philadelphia he visited the vineyard at Spring Mill where Pierre Legaux carried on the most ambitious and most promising of all the early efforts to produce an American wine. Legaux (1748-1827), originally from Metz, had bought the Spring Mill property in 1786 and began planting vines-all French-in 1787. He seems to have been a difficult and unlikable man, but he had a knack for publicity. His vineyard excited wide interest, and when, in 1793, he proposed to incorporate as the Pennsylvania Vine Company the idea was well received in Philadelphia. In that same year he announced that "the first vintage ever held in America" would be held at Spring Mill; it wasn't that, of course, but there was no way to contradict such statements. Legaux did not explain why his first vintage waited until six years after his vines had been planted, but one may guess: most of the original vines had probably died, and those that survived gave only a meager yield. Still, he did manage some sort of vintage (no figures for it are known), as few had managed to do in the many years since American settlement began. When Dufour visited Spring Mill in 1796, he found a desolate scene. The shares of the Pennsylvania Vine Company had not been fully subscribed and would not be for another six years; Legaux was in desperate financial circumstances, and his vineyard was not prospering. Dufour found that only "about a dozen" of Legaux's vines appeared to be worth the trouble of cultivating-and this after some thousands of vines had been planted. Yet no one else was doing any better than, or even as well as, the struggling Legaux. When the time came for Dufour to buy vines, he would get them from Legaux, who maintained a nursery in connection with his vineyard. Since the coastal settlements offered Dufour almost nothing hopeful, he would see what the frontier West might offer. At the end of September 1796, about six weeks after he had landed in Philadelphia, Dufour set out for Pittsburgh, three hundred miles away, probably on foot. From Pittsburgh he went down the Ohio River as far as Marietta, Ohio, but the winter was now closing in. Dufour retreated to Pittsburgh, where he dug in for the winter. In the spring of 1797 Dufour was on the move again. He had heard, while in Philadelphia, that the Jesuits of the Kaskaskia mission in Illinois, founded in 1703 on the banks of the Mississippi River, had had a flourishing vineyard. Since the Jesuit order had been suppressed in 1762 in France's American possessions, including Kaskaskia, the chances that anything useful still survived after thirty-five years of neglect were obviously poor indeed. Yet Dufour decided to make the long and difficult trip despite the odds; since he had not yet found anything at all promising in this country, why not? When he reached Kaskaskia he did in fact find the Jesuits' asparagus bed there, but no vines: "A thick forest was covering that spot, with a luxuriant undergrowth." Dufour doubted that they had ever had any luck with vines in that place, despite the stories he had heard. Dufour did not venture farther up the Mississippi than Saint Louis, where, after a stay of some weeks, he bought what seems to us a strange commodity for a traveler, nearly six and a half tons of lead pigs (the upper Mississippi region, in what is now Missouri, Iowa, Illinois, and Wisconsin, has abundant lead). These he would sell on his return journey. The lead was not conveniently portable, as his supply of Parisian watches was; to move it he had to hire a barge and six oarsmen, who engaged to transport the pigs as far as Cincinnati. It seems to have been a successful venture; the last of the lead was sold in Lexington early in 1799 after much labor and expense in moving it up river and over land. Before the last lead had been sold, however, Dufour had taken a new direction. In October 1797, he reached Cincinnati, then a frontier town in the Northwest Territory. There he sold a quantity of his lead, put the rest in storage, and headed south for the boomtown of Lexington, Kentucky, across the river and eighty miles south of Cincinnati. Kentucky had been made a state in 1792-the first of the trans-Alleghany states-and Lexington was its most thriving town. Dufour spent some days in and around Lexington and liked what he saw of the men and the countryside there. By this point he had decided to quit the fruitless search for a successful viticulture; it was now time to begin for himself. He had Pierre Legaux's Pennsylvania Vine Society as a model for his scheme, which he no doubt discussed with the leading citizens of Lexington during his stay in the town. By January of 1798 he had sufficiently matured a plan to offer it to the public. The January 17, 1798, issue of the Kentucky Gazette, the weekly published in Lexington, contained a letter from Dufour addressed "To the Citizens of Kentucky" and proposing the formation of a Kentucky Vineyard Society to carry out grape growing and wine making in Kentucky: "Now, ye citizens of Kentucky," he said, "is the time to begin to plant the vine." Dufour explained that he was an expert in the matter, or, as he put it, "my predominant inclination since my infancy is the culture of the grape vine." The company was to issue two hundred shares at fifty dollars each; with the money thus raised it would buy land-Dufour had already seen that "convenient situations" abounded in Kentucky. The company would need to buy horses, tools, and ten negroes to work the land. Dufour himself would travel to Europe to buy about forty thousand vines with which to start the enterprise. He promised that an acre of Kentucky vineyard would produce at least five hundred gallons of wine, and, at a dollar a gallon, the costs of establishing even a small vineyard of six acres would be quickly paid off; after that, it would be all profit. In August 1798 he returned to Lexington and began the work of the company in earnest. The first thing to be done was to obtain land for the vineyard. Dufour found what he wanted on the banks of the great bend of the Kentucky River some miles south of Lexington, where he arranged for the purchase of 630 acres. By November of 1798, preparation of the land began. Dufour's contract with the Kentucky Vineyard Society called for him to supply vines of all kinds, "indigenous as exotic," but the "greater part ... brought from Europe"; the expectation was that he would travel to Europe to secure these, and he was given two years in which to make the trip. Accordingly, he set out at the beginning of 1799 on a winter journey overland for the East; characteristically, he detoured to inspect Thomas Jefferson's vineyard at Monticello-he found that it had been abandoned, like most of the other projects he had gone to see in America. At some point in the course of this journey to the eastern ports, Dufour decided not to go to Europe after all but to buy his stock of vines from sources in this country. The voyage to Europe was too dangerous; it would take too much time; and the vines would be at risk over such a long journey. He would remain in the United States and get his vines here. He thus failed to live up to the terms of his engagement with the Vineyard Society; but as it happened, this failure is ultimately what saved Dufour's whole enterprise. He bought a few vines in Baltimore from a German nurseryman, went on to New York, where he bought a few more vines, and then went to Pierre Legaux at Spring Mill, Pennsylvania, who sold him ten thousand cuttings of thirty-five different varieties. That, at any rate, is what Legaux must have told Dufour, though it is highly unlikely that all the varieties were as named, or that the number of varieties was exact. We know for certain that at least two of the vines Dufour bought from Legaux were native hybrids, though no one knew it at the time. But the important thing at this point is that Dufour and the Kentucky Vineyard Society seemed to be set on precisely the same path toward certain failure that all earlier ventures had taken. The idea was still to plant vinifera, or vines "brought from Europe," even if one did not actually get them in Europe. Dufour had now spent more than two years traveling the length and breadth of this country without finding a single successful planting of European vines; he had, on the contrary, found overwhelming evidence that all vinifera plantings had failed. So why would he now plant vinifera? Had he learned anything from all his observations? The answer was, at this point, No. So far as Dufour-and everyone else-was concerned, there really was no alternative. Dufour's contract stipulated that he was to plant "all kinds of grapes," but effectively only one kind was in question. The native hybrids were not recognized for what they were, so the only thing to do was to plant vinifera in new regions and hope, against all hope, for the best. Thus Dufour returned to Kentucky with a wagonload of what he supposed were cuttings of European vines, as no doubt most of them were. Planting began in the spring of 1799 at "First Vineyard," as Dufour styled the site: in that first season twenty-two thousand vines went in. By the next year, twelve thousand of them had died, but Dufour attributed this heavy loss to the lack of labor he suffered. Had they been planted early enough in the season they would, he thought, have survived. And the remaining vines were remarkable for their vigor-Dufour had never seen such rapid growth as his Kentucky vines showed. He now wrote home to Switzerland to advise his relatives and friends that the time had come to join him in America, where his affairs appeared to prosper. Instead, at the beginning of 1801 a small group-seventeen people-of Dufour's family and neighbors left Switzerland for Kentucky; they were all, Dufour said, "poor people who have ... only the means to make the trip." They arrived in America at the end of April, and by July they had safely reached Kentucky, where they entered into partnership with their brother and patron, John James Dufour, to cultivate First Vineyard. Most of the men among the newly arrived Dufours were, confusingly enough, named John: John Daniel, John David, and John Francis, all of them sons of John James Rudolf Dufour of Vevey and brothers of John James Dufour of First Vineyard, Kentucky: there was thus a generous provision for the conservation of Johns. With them were the sisters Antoinette, Suzanne, Marguerite, and Jeanne Marie Dufour, all under the age of twenty. The Dufours were accompanied by three other families, named Bettens, Boralley, and Siebenthal. A single gentleman, Jean Daniel Morerod, was also of the group; he was in love with Antoinette Dufour and had followed her to Kentucky. Notably absent, to us, was Mrs. John James Dufour, who remained in Switzerland with her child. Did she object to America? To Dufour? To both? We don't know. Dufour had already begun to make arrangements for the independent settlement of the newcomers, since the Kentucky vineyard could hardly sustain them all. The idea from the outset was that the Swiss would devote themselves to wine growing. The opening of the Northwest Territory for settlement just at this time provided a welcome place to begin. Land along the Ohio River in what is now Indiana was made available for sale, beginning in April 1801, at a price of two dollars an acre. Dufour had already managed to buy nearly eight hundred acres in this region. Now, early in 1802, he petitioned Congress for a grant, on credit, of some two thousand acres along the Ohio River, to be paid for over a ten-year period. The inducement he held out in asking for these special terms was the great promise of successful wine making: on their new lands, the Swiss would undertake, at a minimum, to plant ten acres of vines within two years of their settlement and to add to them thereafter; they would also give vine cuttings and instruction to people who asked for them, so as to "render the Cultivation of the Vine familiar to the people of the United States." Congress, following the long tradition of official encouragement of wine growing established in this country since the earliest colonial days, granted the petition in order "to promote the culture of the vine within the territory of the United States." Instead of the ten years Dufour had asked for as the period for payment, Congress allowed him a generous twelve. In the summer of 1802, the Bettenses and Morerods (Jean Daniel Morerod having married Antoinette Dufour early in 1802), accompanied by John James Dufour, left the Kentucky vineyard, traveled by boat down the Kentucky River to the Ohio, and up the Ohio to their new lands on the right bank of the river. John James, according to the family story, stepped ashore from the boat, announced that he would "cut down the first tree on our lands," and proceeded to do so, operating with a hatchet on a sapling. The Bettenses and Morerods then began the formidable struggle to clear the land of the powerful forest growth that covered it, while Dufour returned to First Vineyard and the rest of his family. Cutting a sapling was a nice symbolic gesture, but the site abounded in walnut, oak, and tulip trees of "enormous" size, and it would be the work of years to clear the ground. The land was shared with wild life: bears, deer, wolves, and wild turkeys roamed the woods and competed with the settlers for the crops they planted after the labor of clearing had been done. There were Indians about, and there was much anxiety about the threat they posed; luckily, the Swiss never had to fight any Indians on their new property. In the course of the next few years, most of the Swiss would migrate from Kentucky to the new settlement, called "New Switzerland," where they were joined by some other Swiss immigrants who bought land from Dufour. The little colony was under way, but the frontier conditions were anything but easy. Steam had not yet come to the rivers of America; if the people at New Switzerland wanted salt, or iron, or groceries, or dry goods, they had to work their way up the Ohio to Cincinnati in "canoes, skiffs and pirogues" to buy what they needed. And there was always the forest to be dealt with. Meanwhile, back at First Vineyard, what were the prospects? The first year's planting had, as we have seen, suffered devastating losses, but enough survived to provide cuttings for new plantings, and the survivors looked vigorous in the second season, 1800, and again in the third, 1801. Dufour's problems were not only with the vineyard but also with his Kentucky investors, who had not fully paid up their subscriptions to the stock of the Kentucky Vineyard Society; without funds, Dufour could not pay to develop the vineyard as he had originally planned. Together with his family at First Vineyard, he could only conduct a holding operation, on property that had not even been paid for and probably never would be. And if the vineyard could not be made to prosper, the chances that the delinquent shareholders would wish to pay up steadily diminished. Still, the fame of Dufour's work had gone abroad. The possibility that wine might be made to flow from the Kentucky wilderness was intriguing to the popular imagination and even, in some quarters, a cause for anxiety. The distinguished French botanist Franτois AndrΘ Michaux, on a mission of scientific inquiry in the United States for Napoleon's government in 1802, hearing of the prosperous new vineyards in Kentucky, determined to visit them to see if they might actually pose a threat to the French wine trade. Dufour received him politely and invited Michaux to spend the night and the next day with him. Michaux at once saw that Dufour's vineyard was anything but promising. The vines, he found, were unhealthy, the fruit "thin and poor," the chances of a successful vintage slim, for the fruit always rotted before it ripened. Only about six acres had been planted. The stockholders, he wrote, "concerned themselves but very little" with the vineyard and its fortunes, evidently having already concluded that the business was a failure. The accounts of the "pretended flourishing" of the vineyard that had appeared in the press were contradicted by a very different reality. France, Michaux correctly thought, had nothing to fear from this quarter. Dufour was compelled to agree; in this fourth season of the vineyard, 1802, the vines that had seemed so vigorous were all afflicted with a sickness and produced no useable fruit. Michaux had observed that "the grape generally decays before it is ripe," which suggests that the dominant affliction was black rot, though no doubt other diseases were at work too. Black rot, which would later exterminate the vineyards of Cincinnati, would be a sufficient cause of failure by itself. Black rot first appears as small irregular spots on the young leaves of the vine in the spring. It then passes to the fruit, where its effects are not at first evident. When the grapes are well grown, they color prematurely, begin to shrivel and darken, and exhibit ugly black dots on their surface. In a few days they become completely dried and shriveled and are unfit for any use-"hard black mummies," as one authority describes them. The infection may be limited to a few vines only or may devastate an entire crop. Once it is established, it cannot be checked. It grows in humid conditions, and summer rainfall helps to spread it. The disease, once unknown in Europe, was imported there with American vines. By a happy chance, a compound called Bordeaux mixture (copper sulfate and unslaked lime) was later found to control black rot, so it may now be dealt with, though at a heavy cost for labor and materials. In Dufour's day-and in the days of all those unsuccessful would-be colonial vine-growers before him in the eastern regions-nothing could be done against the disease. In this crisis there was one hopeful sign. Amid the general wreckage of his vineyard Dufour noted that two sorts of vine survived and fruited: one was called the Cape grape, the other, Madeira. Dufour had these names from Legaux, who had sold him the vines. The Cape grape, Legaux had said, came from South Africa and was the source of the great wines of Constantia. Madeira was of course supposed to have come from the wine island, though which of the several varieties grown on Madeira it might be was not said. Both of these surviving vines were not what they were supposed to be-they would not have survived had they been. They were instead native hybrids, accidental crossings between some European vine that had managed to survive long enough to flower and a native vine. A seed from the resulting fruit would, if it managed to grow, produce a hybrid vine. If Dufour had gone to Europe to buy his grapes, he would never have found these hybrids and so would never have had the limited success they provided. Whether Legaux deliberately misrepresented his Cape grape, or genuinely believed it to be a true vinifera, does not now matter: in either case he unwittingly helped to bring about the first commercial wine in America. The variety that Legaux called the Cape grape was the first of the accidental hybrids to have been brought into cultivation. It had been found originally near the place where William Penn had planted European vines along the banks of the Schuylkill River outside of Philadelphia in the seventeenth century. The discovery was made in 1740 by James Alexander, the gardener of Thomas Penn, William Penn's son, and so the grape, which has had many names since, was first called the Alexander. Despite its critical importance for the beginning of American wine making, the Alexander has virtually disappeared from cultivation. Dufour never doubted that the Alexander was a vinifera variety, as Legaux had assured him it was. His reason for thinking so was that the Alexander was perfect-flowered; that is, its flower contained both male and female parts and so was self-fertile. Native American grapes are mostly imperfect-flowered (di£cious is the botanical term for this condition), and Dufour therefore had what seemed to him an irrefutable proof of European identity. Others, noting the foxy character of the fruit, the vine's proven ability to survive, and its presence in the American woods, concluded that the Alexander/Cape was a native vine. Both sides were partly right, since, as a hybrid, the Alexander was a bit of both. The fact that hybrids of the American and European grape are generally perfect-flowered was simply not known then. Whether the Cape and Madeira vines were native or foreign hardly mattered to Dufour in 1802. What he needed was a grape that would grow, and these alone had showed that they could do that. Dufour now determined to replant his vineyard entirely to Cape and Madeira vines and to discard all the rest. When he carried out the replanting, we don't know for sure, but presumably he began as early as 1802. The work could not have been done rapidly because he had only a few vines of each variety to supply cuttings for the replanting. More important for the future, Dufour's decision meant that the vineyards in New Switzerland, too, would be exclusively planted to the Cape and Madeira, and so the same old mistake that had baffled all attempts at wine growing in this country would be avoided. Dufour did not know the meaning of what he had done, for he thought that he was still planting vinifera. But he was not, and that made all the difference. First Vineyard produced a little wine from the Cape and Madeira grapes in 1802, and this, Dufour tells us, was drunk by some of the Vineyard Society's shareholders early the next year. There was another vintage in 1803, and Dufour thought well enough of this to send some of it to President Jefferson. Henry Clay, prominent in Lexington society though not yet in national politics, and a shareholder in the Kentucky Vineyard Society, collected money to help pay for getting the wine to Washington. The trip was made by Dufour's younger brother Francis, who led a horse carrying two five-gallon kegs of wine through the winter wilderness to Washington in January-February 1804. The wine was duly presented to Jefferson for his opinion; he diplomatically replied that the wine was too young for an opinion to be given. Always more than eager to find and encourage any evidence, however slender, of promising American wine making, Jefferson could only say in this case that Dufour's Cape and Madeira wines had "a body capable of becoming good." He then presented the wine to a committee of Congress. Dufour had to be disappointed. In the next year, Dufour determined to return to Switzerland to collect his family and settle his affairs there. Leaving the First Vineyard in the care of his brothers Francis and David, Dufour set out for the East Coast early in 1806, just short of ten years from the date of his arrival in the United States. In New York he booked passage (in steerage) on a brig named Edward Young, which sailed for Bordeaux in April 1806. When the ship was approaching Bordeaux early in May, it was captured by an English ship, one of many such incidents at the time, when England was seeking to deny supplies to Napoleon by intercepting neutral ships-the practice that was a main cause of the War of 1812. Dufour and the other passengers were taken to Plymouth and kept there for a month before being released. Dufour then went to London, took passage to Rotterdam, and arrived in Vevey on August 14, 1806. And now follows an episode-perhaps one ought to call it a long, long chapter instead-vividly showing the difference between the pace of life then and now. Dufour had returned to Switzerland in order to close out his affairs there, intending to go back to America afterward. With whatever he might realize from the sale of the property belonging to him and to others of the Swiss colony, he hoped to pay off the debt on the Ohio lands. One supposes that a few months, at most, would be sufficient for the purpose, and that a few months more would see him back at First Vineyard. As it happened, Dufour spent the next ten years in Vevey! Why? Doing what? We don't know that there were any special difficulties in his affairs. Europe was still at war, but that had not barred his return to Switzerland. He had a wife and son in Vevey, but he had already managed to endure a ten-year separation from them (and would again leave them behind him when at last he returned to the United States). And while he remained in Switzerland, the people in New Switzerland would get nothing of the financial assistance that had been the reason for the trip in the first place. Whatever the reasons may have been, the fact is that Dufour did not return to America until 1816. Back in New Switzerland, the Swiss could not generate enough profit from their farms and vineyards to pay the debt and had to petition Congress for an extension; Congress obliged by a special act in 1813, allowing another five years for payment. Up until his return to Europe in 1806, Dufour, though living at First Vineyard in Kentucky, had kept in touch with the fledgling Swiss colony in New Switzerland. We learn that he delivered a Fourth of July oration there in 1805, and he must have been the source of vines for the vineyards there when they were first planted. During his ten years' absence back in Switzerland, he corresponded with his American family and kept himself informed of their activities as well as the slow communications across the wartime seas would allow. But the establishment of New Switzerland, and the achievement of a regular commercial production of wine for the first time in the United States, were not his work. Without him this production would not have been possible, but the actual work was done by other people, and it was done in Dufour's absence. Having cleared away some of the forest, and having reached some sort of accommodation with the local wildlife, the settlers in New Switzerland managed to produce a small quantity of wine in 1806 or 1807-the date is not certain. The very earliest time at which vines might have been planted in New Switzerland was 1803, in the first spring after the settlement began. Once the vineyards were started, their growth was gradual but steady, though of course never sufficient to support the community. They lived as general farmers, growing much of their own food, producing grain and grinding it for flour, planting orchards, and raising hogs and cattle, just as the rest of rural America did. Wine making was an essential activity, but not a primary one. A boost to the settlement came in 1809, when Francis and David Dufour at last abandoned First Vineyard and, with their families, came to settle in New Switzerland. The Kentucky venture, after ten years of struggle, was ended; all of the Dufours-except for the absent John James-were now united on the banks of the Ohio. In your land to establish his throne. The image of a smiling Bacchus on the unkempt banks of the Ohio is comic enough, but the excitement and pleasure behind the extravagance of the poem seem genuine. The development of wine-growing at Vevay (as the town laid out in 1813 had been named, the spelling changed to guide American pronunciation) probably reached its peak around 1820, when 12,000 gallons of wine was produced from forty to forty-five acres of vineyard. These are hardly overwhelming figures, but in such matters all is relative. Relative to the long history of failure, the 12,000 gallons of Vevay wine was a sensational success; and if that kind of success could be achieved in what was still frontier country, what might the more settled places accomplish? What was the wine like, really? The American experience of wine at the beginning of the nineteenth century was not very sophisticated, to put it mildly, and it is doubtful that many experts ever drank any Vevay wine. Moreover, it is always difficult to express judgments about such subjective matters as taste in a clear and persuasive way. Besides, people obviously wanted Vevay wine, the first American wine ever produced in any volume, to be good, and were willing, as patriots or well-wishers, to stretch the truth a bit in reporting on it. 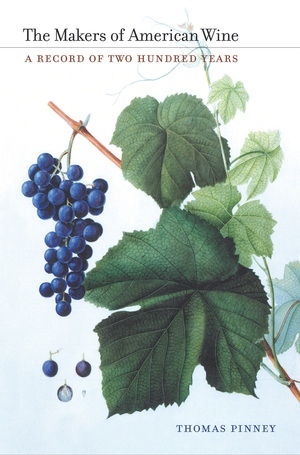 The Cape grape, the child of a native labrusca vine and an unknown vinifera, certainly had the notorious "foxy" taste and aroma of labrusca grapes. Dufour spoke of it as having "the taste of the strawberry, which gives a fine perfume to the wine." A dark blue grape, the Cape grape was fermented on its skins to make a red wine. One of the earliest to report on Vevay wine, a woman writing in 1809, said that it was made from "Clarret Grapes" and was "excellent." Two years later, a gentleman reported cautiously that the wine "is found to be of good quality" but did not explain who found it so. Another reported in more detail: "The Claret was rich in quality, but too acid. It was, however, a very palatable and pleasant beverage when diluted with water." Ten years later the wine of Vevay was given a most enthusiastic endorsement by a traveler named William Hall: "The wine is like Claret and very fine. We bought some at a dollar per gallon: and I never desire to taste better." On the other hand, Timothy Flint, the much-traveled writer, editor, and missionary, found that the wine of the Cape grape was "not pleasant," and the German traveler Karl Postel was even harsher: Vevay wine, he thought, was "an indifferent beverage, resembling any thing but claret, as it has been represented." Most emphatic of all was Dr. John Godman, a distinguished anatomist and naturalist who had lived in Cincinnati and so would have had ample opportunity to try what the Swiss were making. "Vevay wine," he wrote, "is a perfect nondescript; in colour it slightly approaches thin claret; its taste is altogether peculiar ; something like it might be made by sweetening vin de grave with brown sugar. Nothing but a strong effort of courtesy, however, can induce any one seriously to call it wine, unless the fact of its being made from grapes be sufficient to secure it this title." The list of such conflicting opinions might be greatly extended without helping much to settle the question. But it is more than probable that Vevay wines would not please us today. The American hybrids don't make good red wines, and only when nothing else is available would one choose to drink them. Nicholas Longworth, who did know something about wines, thought the Swiss had made a mistake by making a red wine from the Alexander; it was, he said, "a hard rough red wine ... only calculated to make a fine wine sangaree." A white wine, such as Longworth made from the Catawba, might have been a better bet. While John James Dufour was still absent in Switzerland, Indiana wine making received an unexpected boost when the religious community founded by George Rapp at Harmony, Pennsylvania, migrated in 1814 from the stony hills of western Pennsylvania to the rich flatlands along the Wabash River in southwestern Indiana. George ("Father") Rapp (1757-1847)) had been a vinedresser at Iptingen in his native Wⁿrttemberg before receiving the religious revelation that made him a prophet to his own community and a heretic and rebel to the functionaries of the Duchy of Wⁿrttemberg. Rapp preached, among other things, that baptism and communion were of the devil, and that schools were evil; within the community of believers that grew up around him, communism and celibacy were the rule. Holding to such beliefs obviously set the Harmonists apart wherever they might go, and though they were not officially persecuted in America as they had been in Germany, they never fit easily into the life around them-nor did they wish to. They lived in the certainty of the Last Days, when Rapp would present his congregation to Christ and superintend their transfer to Heaven. Though firmly otherworldly, the Harmonists were nevertheless a thrifty and efficient people; within a few years they created a prosperous community in Pennsylvania, and they duplicated the feat after the move to Indiana, where they again called their settlement Harmony. They had had a vineyard in Pennsylvania and had made wine there, not very successfully, from the Cape and Madeira grapes, as the Swiss were doing in Indiana. A major reason for their leaving Pennsylvania for Indiana was the hope that the new territory would be better suited to viticulture. It was and it wasn't. The climate was warmer, but the native diseases were just as lethal along the banks of the Wabash as they had been along the banks of the Connoquenessing. And the Harmonists, though they made Indiana wine from the Cape and the Madeira, could never accept, as Dufour had unknowingly taught the Swiss at Vevay to accept, that they must learn to do without vinifera. They imported large quantities of all the standard German varieties in 1816, and again in 1823, though the vines of course inevitably failed. By that time, they were ready to move on, or rather, back, to Pennsylvania. In 1825 Rapp managed to sell Harmony, lock, stock, and barrel, to the wealthy Welsh philanthropist Robert Owen, who meant to convert what had been the site of a religious community into that of a secular community with Utopian aspirations. The vineyards of Harmony at the time of Owen's purchase had an extent of some fifteen acres, but they had no future: Owen proclaimed that New Harmony, as he now called it, would be teetotal. The communal experiment under Owen's direction soon foundered, although the Owen family remained as proprietors in New Harmony. No more is heard about Wabaschwein, as George Rapp had called the produce of his Harmony vineyards. He had led his community back to Pennsylvania, where they founded their last settlement, called Economy, on the banks of the Ohio below Pittsburgh. There they made only a little wine but prospered greatly in other ways before declining into extinction, as is the habit of celibate institutions. For the ten years that Harmony and Vevay had both made wine-from 1815 to 1825-Indiana was the unchallenged leader in the first era of commercial wine production in this country. The wine wasn't very good, and there wasn't much of it, but it made a beginning, and it renewed the idea that this might, after all the earlier disappointments, become a wine-growing country. John James Dufour at last returned to this scene in 1816, when the wars that had convulsed Europe were ended. Again, his wife did not accompany him. His position in the family had, inevitably, been greatly changed in his long absence. A whole community had grown up when he was away, and he was not among its leaders. As though to signify this change, Dufour, on his return, settled on the property he had bought in 1801 some miles up the river from the main property around Vevay. He built a house, described as a modest one-story structure of brick, on his farm, which he now named "Dufouria." There he planted vines and fruit trees, maintained a nursery from which he supplied cuttings and young trees to the neighbors, and perhaps made a little wine: we aren't sure. In the first years following Dufour's return from Switzerland, the wine business at Vevay was doing well, but in the decade of the 1820s the signs of decay began to appear. The agricultural depression following the banking panic of 1819 lowered prices and slowed the markets, so the attractions of wine growing declined while its difficulties increased. Improved transportation made imported wine more readily available and gave Vevay wine a competition it could not long withstand-to say nothing of the cheap whiskey that was everywhere available, on the frontier as well as in the settled regions. The first generation of Vevay's settlers were all bred to wine making and had come to America with the express purpose of continuing in that trade; their children had no such commitment and were drawn to the many other opportunities before them in a developing country. Finally, and probably most important, the obstacles of disease and climate were at last too much to struggle against. By the 1830s, the wine business at Vevay was over. The condition of the decaying town is described by a visitor in 1828: "The town is on the decline; it has a court-house, and two stores very ill-supplied. The condition of these, and the absence of lawyers, are sure indications of the poverty of the inhabitants, if broken windows, and doors falling from their hinges, should leave any doubt on the subject." Dufour must have seen all this coming. There is even some reason to think that he intended to leave Vevay and return to Switzerland to live. His wife died in 1823; by law, half of her estate went to her son, who had followed his father to Vevay. The son then transferred his inheritance to his father in exchange for Dufour's property in and around Vevay, a move that seems to show the father's intent to abandon Indiana for Switzerland. But if that was the plan, it did not come to pass. In 1825 Dufour began what would be his last work, a book about wine making for Americans. In preparation for it, a circular bearing the name of his brother Francis was sent out asking for any experience in grape growing and wine making to be reported. How much information Dufour may have received from this inquiry we don't know, but the book, though padded by long extracts from various authorities, is in part written out of Dufour's own experience. He had learned for himself what he had to say. The American Vine-Dresser's Guide, Being a Treatise on the Cultivation of the Vine, and the Process of Wine Making, Adapted to the Soil and Climate of the United States, was published in Cincinnati in 1826. It is, in many ways, a clumsy effort at bookmaking, ill organized, padded, often obscure. But one is grateful to have it for the history of Dufour's stubborn and determined effort to make wine in America. It makes clear Dufour's conviction that the would-be winemaker in America has no choice but to accept what the country allows-in Dufour's case that was the Cape grape-and to forget what one knew in Europe. He also urged those who had time and money to continue searching for new varieties and to assist nature in their creation-that is, to take up hybridizing. Dufour was unlucky with his book, as he had been unlucky in so many other ways. It was on a trip he made to Kentucky to sell the book that he fell ill; he died back at his farm on February 27, 1827. Some Two hundred copies of his book were in his house at the time of his death, a substantial part of the entire printing of five hundred. The book could not have been widely disseminated and is now rare. The American wine making career of John James Dufour was in many ways unimpressive: it was slow to start, it was much interrupted, and it was of brief duration. Nor did it culminate in any obvious or substantial achievement. First came the nearly twenty years of preparation in Switzerland; then eight years of frustrated labor in Kentucky; and then ten years of inactivity in Switzerland while others carried to success in Indiana the work that he had begun. The last eleven years of his life he spent working apparently in self-imposed solitude. It seems somehow characteristic that even his grave site in not now certainly known. Had he not written The American Vine-Dresser's Guide, Dufour would by now have been wholly forgotten. As it is, he has a secure niche in the early history of American wine growing. Despite the failure of the Kentucky Vineyard Society, and despite Dufour's failure to recognize the true nature of the Cape grape, it was with the grape that he selected and at the place he selected that commercial viticulture and wine making began in the United States. Dufour deserves at least a modest monument. Americans learned how to make wine successfully about two hundred years ago, after failing for more than two hundred years. Thomas Pinney takes an engaging approach to the history of American wine by telling its story through the lives of 13 people who played significant roles in building an industry that now extends to every state. While some names—such as Mondavi and Gallo—will be familiar, others are less well known. These include the wealthy Nicholas Longworth, who produced the first popular American wine; the German immigrant George Husmann, who championed the native Norton grape in Missouri and supplied rootstock to save French vineyards from phylloxera; Frank Schoonmaker, who championed the varietal concept over wines with misleading names; and Maynard Amerine, who helped make UC Davis a world-class winemaking school. Thomas Pinney is Professor of English, Emeritus, at Pomona College. He is the author or editor of several books including the two-volume A History of Wine in America (UC Press). The second volume of this definitive wine history won the 2006 International Association of Culinary Professionals Award for best book on wine, beer, or spirits.